In my two previous editions (here and here) I published some shapes to represent BizTalk Server physical architectures, Integration architectures (Cloud or Hybrid scenarios) or solutions. In this resource I change the name of my Visio 2013 Stencils resource, now is called “Microsoft Integration Stencils for Visio 2013”, to include almost the Microsoft Integration Stack. This package contains a set of symbols/icons (258 shapes) to that will help you visually represent Integration architectures (On-premise, Cloud or Hybrid scenarios) and solutions diagrams in Visio 2013. It will provide symbols/icons to visually represent features, systems, processes and architectures that use BizTalk Server, Microsoft Azure and related technologies. That you can use and resize without losing quality, in particular, the new shapes. I didn’t create all of this shapes, only a few of them, the rest it was one the work of gathering some resources and combine them together. There are still many points that could be improved as well as adding new stencil, but it is a good start. 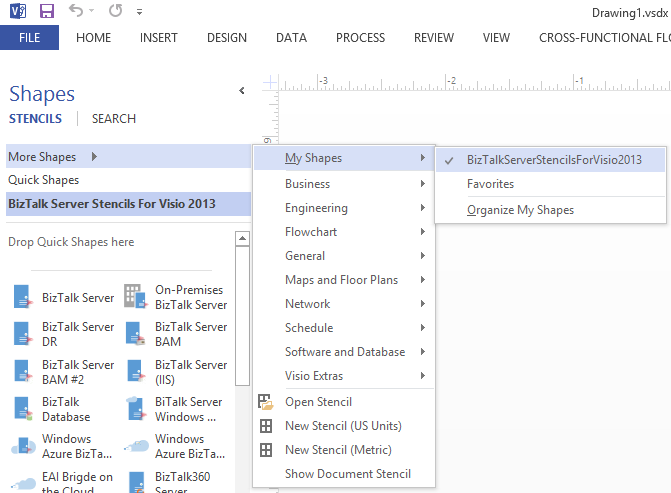 Great new set of Microsoft hybrid integration Visio stencils from Sandro Pereira – includes BizTalk, BizTalk Services, Azure App Service, PowerBI and more!